The myth of coffee has its roots from the ancient times. The popularity of coffee made people believe different things about how coffee affects our health. Some of the things about coffee are true, others are just myths that have been sustained over the years. Coffee is mainly accused because of its main ingredient,caffeine. Caffeine is a natural substance found in leaves, seeds or fruits, in more than 60 plants. These include coffee, cocoa beans, the cola nuts and tea leaves used to make many of our favourite soft drinks or beverages such as coffee, tea, cola drinks and various foods such as chocolate. Coffee is consumed daily by 80%-90% of the adult population. For millions of people is a real passion. Coffee is an enjoyment of everyday life. There are many misperceptions about the properties of coffee and the effects on our health. People like drinks containing caffeine since ancient times. 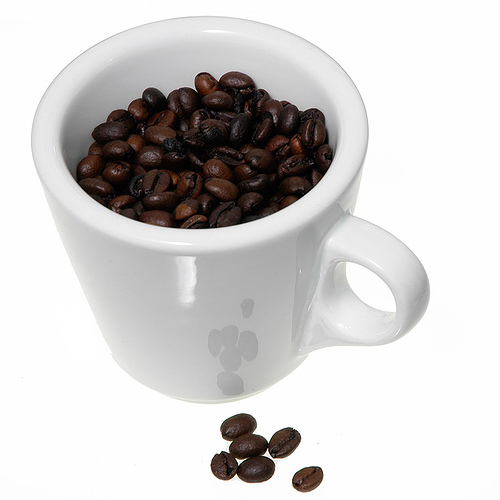 Coffee began to be used in Africa around 575 AD, when the beans were used as money and consumed as food. Caffeine, the main ingredient of coffee, is found in more than 60 different plants. Caffeine can also be manufactured synthetically and used as an additive in food, drinks, beverages and soft drinks. Only coffee contains caffeine? No. The chemical substance is found in other vegetable products such as tea. Moreover, there is the trend to add caffeine in soft drinks of type cola. What are the properties of caffeine? The caffeine is a mild stimulant. People vary greatly in their sensitivity towards caffeine. Although many people can drink several cups of coffee within one hour and not observe any side effects, others may feel some effect after one serving. The caffeine after admitting to the digestive system is absorbed and distributed in the body too quickly. It does not accumulate in the blood or body and is excreted normally a few hours after consumption. Caffeine increases the levels of dopamine in the brain. The dopamine makes us feel better and improves our mood. The caffeine has significant properties that affect different body systems and functions. It affects the brain and is in fact a stimulant of the central nervous system. Recent surveys showed that moderate doses improve memory. The caffeine affects also the urinary system. It has diuretic properties. It is considered that in high doses due to increased diuresis can cause dehydration. That is why those who drink beverages or drinks with high concentrations of caffeine must also drink plenty of water. Caffeine can also cause decreased appetite. The sensitivity of each individual in caffeine is different. This means that everyone responses different to caffeine and to the quantity needed to produce positive or negative effects on our health. During the years people had developed several perceptions about coffee. Many of the things believed are true but there are also some misconceptions about the effects of coffee on our health. Below we explain the most important coffee myths. This is particularly true for those who do not drink coffee very often. In this case, they have insomnia and their sleep is disturbed if the coffee is consumed 30-60 minutes before going to bed. Other people cannot sleep, even though they drunk coffee three or four hours before falling into bed. All depends on the sensitivity of everyone to coffee. For those who drink coffee regularly caffeine does not affect their sleep. To void insomnia from coffee, the best solution is to not drink coffee or not to consume products containing caffeine after five in the afternoon. 2. Coffee helps get relief from stress? No. Precisely the opposite is true. The caffeine helps to increase stress on people with anxiety and on people suffering from panic attacks. 3. Can we drink coffee when we take drugs? It would not be logical to ban the consumption of one or two cups of coffee to someone who follows a treatment with drugs. It should be noted however that caffeine increases or weaken the influence of certain drugs. Taking stress, antidepressants and barbiturates should not be accompanied by a large quantity of coffee. With other medicines reasonable quantity of coffee (1 or 2 cups) is allowed. 4. The coffee and cigarette is a bad combination? The coffee and cigarettes usually go together. All investigations have shown that smokers have a tendency to consume larger quantities of coffee from non-smokers. Nicotine has the effect of accelerating the elimination of caffeine from the body and the smoker feels the need to maintain the levels of caffeine in the body so increases the intake of caffeine. According to research findings, those who quit smoking do not reduce the consumption of coffee until at least six months. We should note that decaffeinated coffee increases the desire for a cigarette. Many people have the conception that coffee after a meal is necessary for digestion. But the various investigations do not confirm this view, especially since coffee makes the digestion of other foods more difficult. The sensitivity of everyone to coffee is also relevant in this case. 6. Caffeine increases the risk of cardiovascular disease? In healthy people, moderate coffee consumption (2-4 cups a day) has no adverse effects on the heart. No investigation could confirm that there is a link between heart attack and consumption of coffee. Regarding blood pressure, coffee, tea and other drinks containing caffeine, do not cause an increase in the blood pressure. Some people sensitive to caffeine may have the experience of a very small, temporary increase in blood pressure, which usually lasts no more than a few hours. The sudden interruption of coffee to those who drink coffee regularly can bring the following symptoms: fatigue, drowsiness, headache, and irritation. With a cup of coffee symptoms disappear immediately. The problems of deprivation usually begin 12 to 14 hours after the last cup. Fortunately, however, the detention syndrome decline gradually to disappear completely after one week. There is no certain amount of coffee consumption, to create dependency on caffeine. Even a cup of coffee or three cola soft drinks, are enough to cause addiction in susceptible individuals. 8. The caffeine increases the risk of cancer? The suspicion that caffeine could be a risk factor for developing some form of cancer has not been proven with scientific research. Two recent studies found no relationship between coffee consumption and cancer. 9. Caffeine has a contribution to the development of breast diseases? All clinical studies to date show that consumption of caffeine does not increase the risk of breast cancer and is not related to the development of breast disease. Coffee is not a venereal, but it can help create better mood. There are though cases that relate infertility with excessive consumption of coffee. In such a case then it is recommended for the pair to limit the consumption of coffee. 11. Caffeine affects children more than adults? The children are not more sensitive to the effects of caffeine than adults. Generally caffeine is excreted from the body twice as fast in children than in adults. Despite the fact that moderate coffee consumption in children does not create risks, we should avoid giving children drinks with caffeine because it could affect their diet. In addition the children who are too vigorously or who have hyperactivity, caffeine should not be given because it causes agitation. 12. Coffee can help you recover from a hangover? We need to emphasize that it is a myth that coffee can help someone recover from a hangover and make him feel calmer. Coffee is no antidote for drunkenness. What coffee can make in a drunk is to help him stay awake. The disturbances caused by the excessive consumption of alcohol on mental abilities are not altered by caffeine.